Sprint, on the 1st of November, announced its own version of the SAMSUNG GALAXY TAB 2 10.1 and is now made available for sale at a price of $550 plus tax and surcharges on the company's website. The tablet sports a 10.1 inch Super LCD display with a resolution of 1280 x 800 pixels and a pixel density of 149ppi. The dual-core 1.5GHz Qualcomm Snapdragon S4 MSM8960 powers the tablet with the Adreno 225 GPU bundled up with 1GB of RAM. Also, there is 8GB of native storage that can be expanded via microSD cards. A 3MP camera is there on the back and also, there is a VGA shooter up the front. The tablet comes with Android 4.0 installed and it also offers LTE connectivity over Sprint's 4G network. The new tablet maximizes home entertainment -- watch video, listen to music, and surf the Web. It includes the built-in IR Blaster, which allows owners to use the device as a universal smart remote. It also boasts an on-device encryption and VPN access as well as a 7,000mAh battery, allowing business users to stay connected. 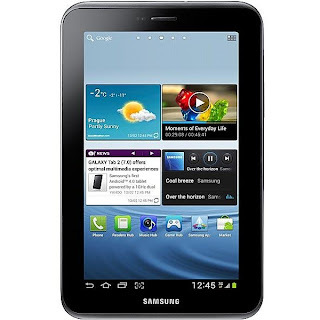 0 Respones to "SPRINT’S SAMSUNG GALAXY TAB 2 OUT FOR SALE"